WrestleMania 31 is coming. Time to buy WWE stock? WWE shareholders got kicked in the chest in 2014. But they are flying high again so far this year. 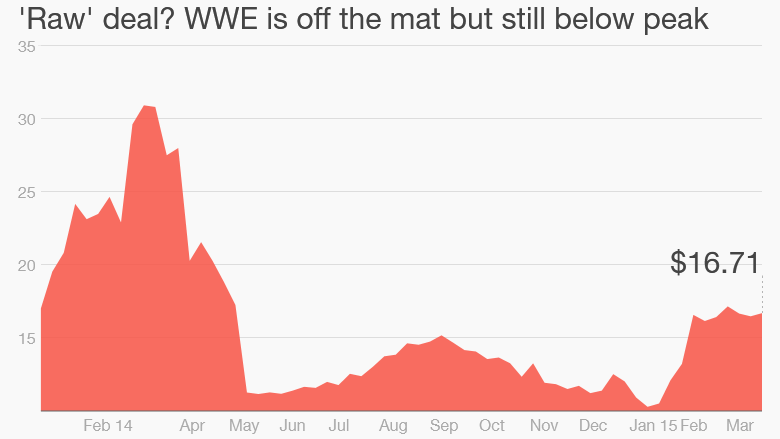 Shares of WWE (WWE) are up more than 30% so far in 2015. But many investors may still feel like they're stuck in a choke hold: The stock is trading about half of what what it was worth last March when it topped $31 a share. Is there going to be another post-WrestleMania slump like last year? Tough start for new network: At this time a year ago, investors were excited about the company's new WWE Network -- a streaming video app that would give subscribers willing to pay $9.99 a month access to current and archived events, such as WrestleMania -- which is the "sport's" Super Bowl. This was hailed as a bold move since it cut the broadcast and cable TV networks out of the picture. The WWE was slightly ahead of its time. Since the launch of the app, CBS (CBS) and HBO (owned by CNN parent Time Warner (TWX)) have also unveiled plans to let cord cutters pay a monthly fee to watch shows digitally. Many other networks are expected to roll out similar over-the-top services soon. But the WWE Network didn't live up to the hype initially. Investors panicked when the company didn't add as many subscribers as the market was expecting. There were also concerns that the WWE was spending too much to invest in the streaming network -- and that the app could eat into the company's lucrative pay-per-view business for big events. The company reported a net loss of $30 million last year and pay-per-view revenue plummeted. That led to the stock's huge plunge from its highs. The WWE also wound up announcing layoffs last summer. Flying high again: But the stock's recent rebound is a good sign. The worst may be over. WWE may have just performed a miraculous kick out before the market referee got to the count of three. Even though pay-per-view sales fell 62% in the fourth quarter, overall revenue for its media division were up 26% thanks to some changes the company made that brought in more subscribers for the app. The WWE ended a requirement that subscribers commit to six months of the WWE Network before signing up. It also made the app free during November. 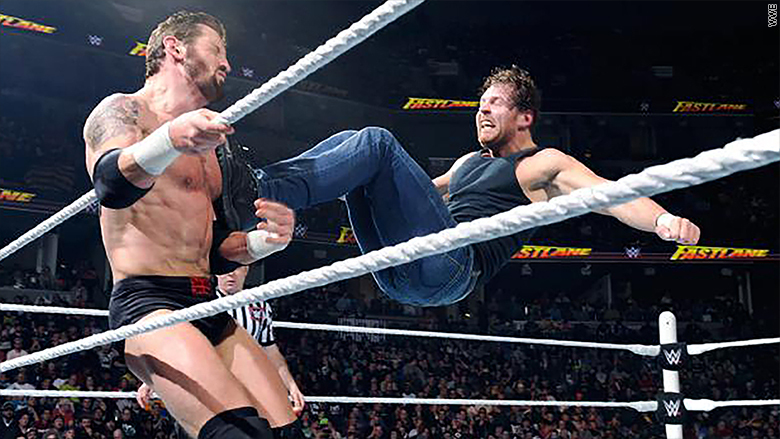 That helped push the WWE Network's subscriber account to above 1 million by January. This is significant. The WWE is a media company first and foremost. Its media business, which also includes revenue from TV deals it has with Comcast's (CMCSA) NBCUniversal unit, account for nearly two-thirds of overall sales. The rest comes from the live events themselves. consumer products and a small movie studio business. And there is more good news for WWE on the TV front. It reached a new contract with NBCUniversal last May to keep its weekly Raw show on USA and SmackDown on Syfy running for the next few years. There were some concerns that NBCUniversal was not going to renew the deal. So is WWE stock worth buying? It's still very risky. Last year's growing pains with the WWE Network clearly show that this is a company whose business model is in transition. And even though analysts are expecting WWE to return to profitability in 2015, shares trade at 55 times earnings forecasts. That is very expensive. To put it in context, the stock is more expensive than Facebook (FB), which WWE just announced a partnership with on Friday to promote WrestleMania 31. Facebook is not cheap either at 42 times earnings estimates. But if you're a fan, there's probably little harm in shelling out $17 for 1 share. It pays a dividend that yields 3%. And you can brag to your friends that you own the WWE along with Vince and Linda McMahon.